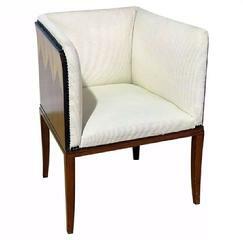 Club chair with hardwoods and veneers and fabric upholstery. East Indian Rosewood, African Mahogany, Afromosia, Maple veneer with sold ebony trim and black upholstery tacks. 31.75"W x 25"W x 22"D; seat height 19.25". Very good original condition, with some minor scratches. Veneer is as new, stable and bright. No overall sunfade, fabric is good. This is a museum quality reproduction of Eliel Saarinen's chair for beside the fireplace in his own home at Cranbrook. The chair is part of a limited edition produced by Arkitektura, a retail furniture store in Birmingham, MI in the early 1980's. The store focused on furniture by Saarinen, his son Eero, and other Cranbrook affiliated artists. Possibly Serial Number #37.